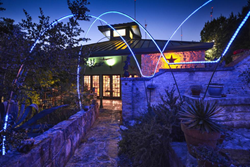 An Austin home that pops with art, lights and water is for sale and featured this week at TopTenRealEstateDeals.com. Home features a 90,000-gallon pool that flows under a bridge, a waterfall and spectacular night lighting. Austin rocks! As does its live music venues and has developed a penchant for all art forms, including but far from limited to sculpture parks, museums, theater and a plethora of establishments to celebrate with before and after parties. Some of the largest and most successful companies in the the country are also located in Austin and their employees get the best in entertainment and a living environment with clean air and no issues. One interesting community group works toward Keeping Austin Weird, which in loose translation encourages freedom of speech, freedom to create and freedom to build and live in avant-garde structures. Forbes has considered Austin first on their Cities of the Future list and second for Best Cities for Millennials, so its reputation as a great place to live isn’t just some new campaign from the local Chamber of Commerce. Currently offered for sale is a five-acre enclave called Las Casitas House & Garden in the Westlake bedroom community. Lushly planted, it appears to be a somewhat cultivated jungle with complete privacy, pool, waterfall, koi ponds, trails to explore and gardens with sculptures and various artworks to discover along the paths. There are three casitas with one large and the other two slightly smaller, all tucked within the trees and thick foliage, providing privacy, views into nature and within earshot of falling water. At night, water features are lit for viewing and exploring making the entire property seem magical. Earth-conscious buildings have been created from wood, stone and large expanses of glass with the large casita featuring 20-foot soaring wood ceilings and beautiful views both day and night. Each casita is designed for light independent living - some with indoor and outdoor baths. A 90,000-gallon pool with grotto that flows under a bridge with a waterfall dropping from its center is made even more spectacular with night lighting. For entertaining on a grander scale, there is a large covered pavilion surrounded by the deep tropical growth that will seat up to 50 people and has its own natural terrace stage - a perfect venue for a big Texas BBQ or for more formal affairs. Within the 5-acre estate, there are many building sites that would easily accommodate a new 5,000-square-foot or larger home. The listing agent is Dave Murray of DMTX Realty, Austin. Developed by an architect/engineer over a span of 20 years, Las Casitas House & Garden is available for sale for the first time. Priced at $3.5 million.